Disclaimer: My family was provided with complimentary admission to the aquarium in exchange for an honest review. All thoughts and opinions shared are my own. 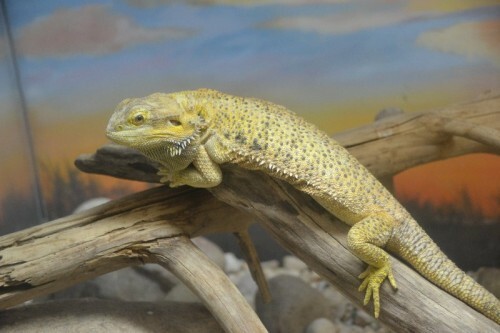 We are lucky to have two really great aquariums on opposite ends of Connecticut. 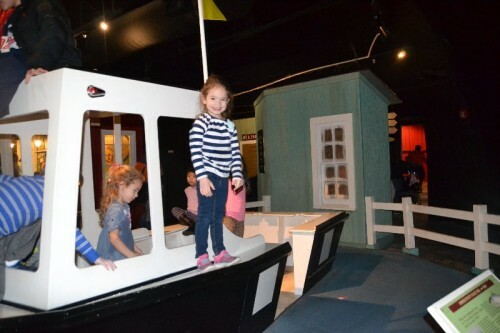 The Maritime Aquarium, located in Norwalk, CT, is the perfect day-trip in the southern part of the state . 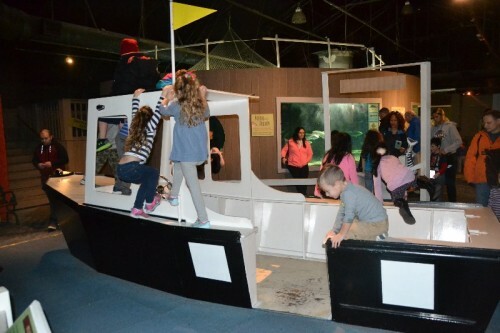 The aquarium is celebrating its 30th year and continues to be one of Connecticut’s most popular tourist attractions. 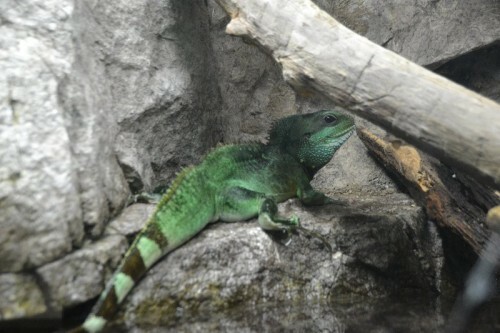 The aquarium features local animals from Long Island Sound and beyond. They are committed to protecting the Long Island Sound ecosystem through their in-house efforts and education of guests. 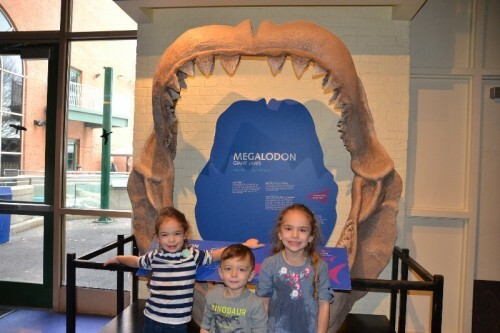 Our visit to the aquarium was during their very popular Lego Weekend. 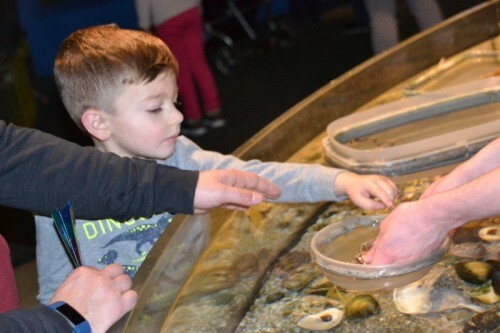 The aquarium has special events throughout the year including outdoor attractions and cruises (additional fee) during warmer months. If you’re looking to avoid large crowds plan your visit during off-peak days. There is plenty of parking nearby. The aquarium has metered parking and a parking garage across from the main entrance. There’s also access from nearby train stations and boat docking! The aquarium has a cafe for lunch and snack breaks. 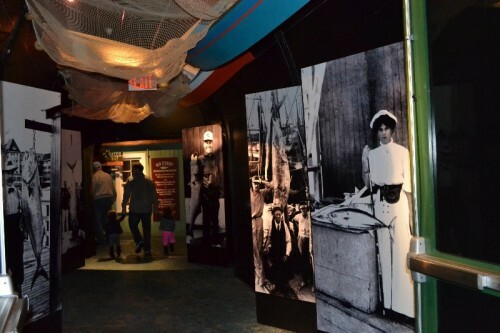 It’s open daily from 11 am – 3 pm. Outside food is not allowed. The aquarium is large but not overwhelming in size. It’s the perfect size for an all-day adventure. 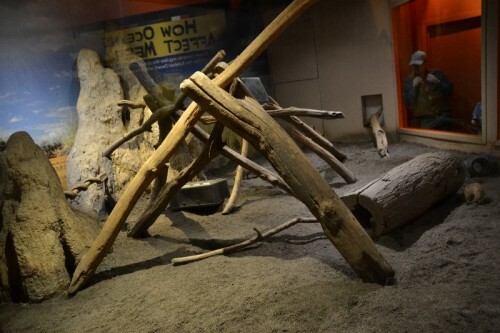 Most of the exhibits are indoors so it’s a perfect spot for cold or rainy days. There is plenty to see and touch for all ages. 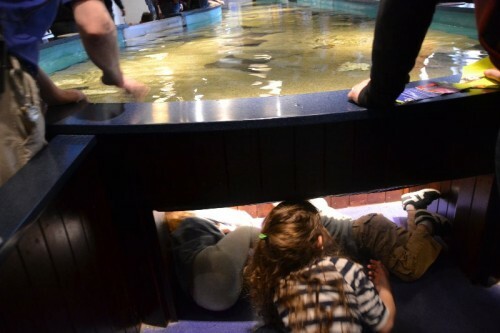 My kids loved the exhibits where they could get their hands wet and touch the animals. 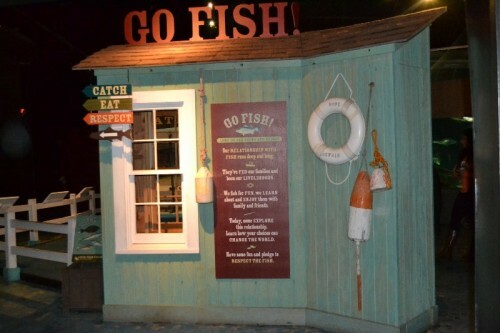 Here are a few of our favorite and most popular exhibits. 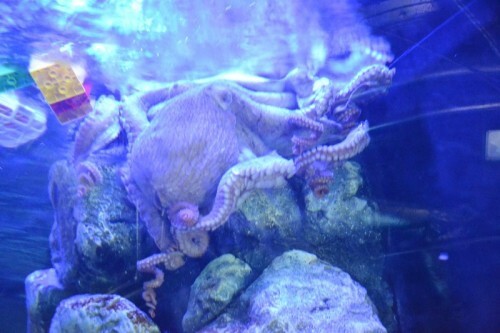 As expected, the aquarium houses many large tanks filled with interesting underwater animals. Even though we visited on a very busy day we were still able to get close enough to see all of the underwater life. 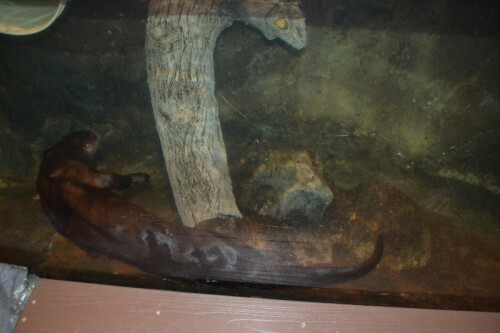 The river otters are a family favorite. They’re playful, fast moving and the kids love them. 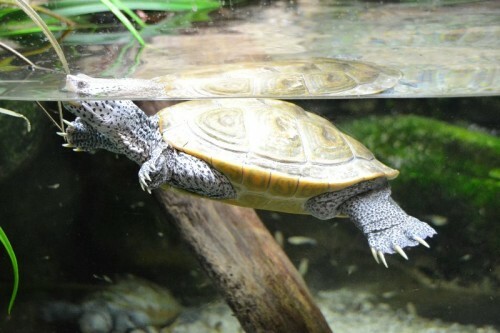 There are many different viewing spots and since they run around, dive and swim there’s a good chance you’ll be able to get an up close look at them. They’re so quick it was hard to get a great picture. 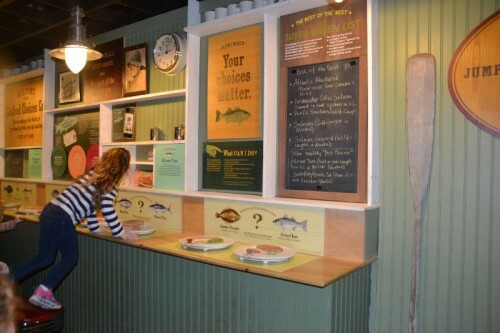 One of the most fun parts about the aquarium is the interactive exhibits. 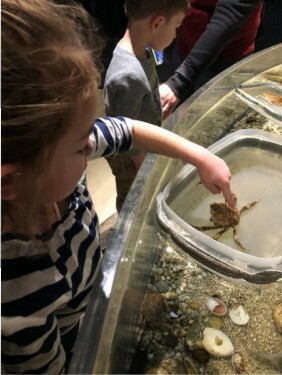 We loved being to touch the animals in the touch tanks. 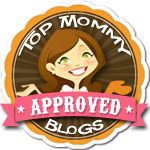 It’s a great spot to learn a little more about the animals and get a more comfortable with them. 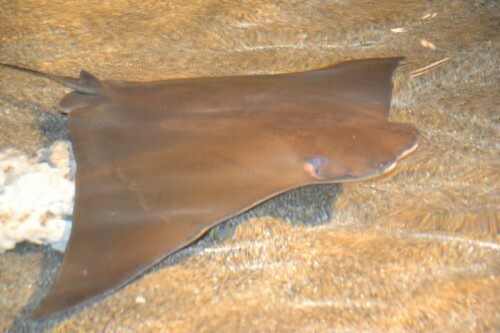 The ray and shark pool might have been the favorite exhibit for my kids. 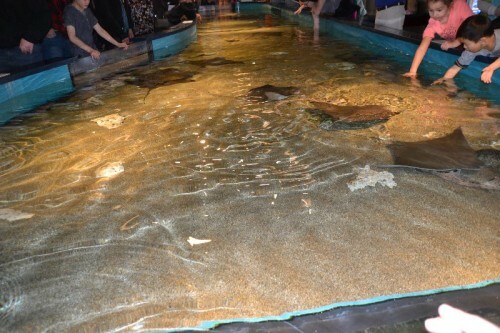 They loved that they were able to put their hands in the water and touch the rays. 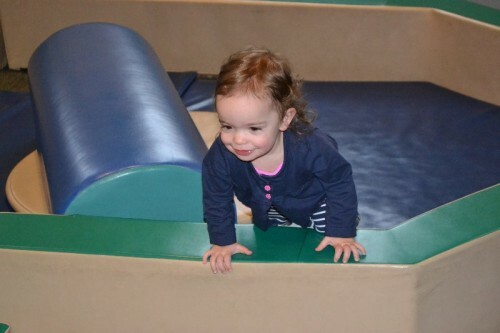 There are steps for little ones to stand up and get a better look. There is also an underwater peephole for the kids to get a look from underneath the water. 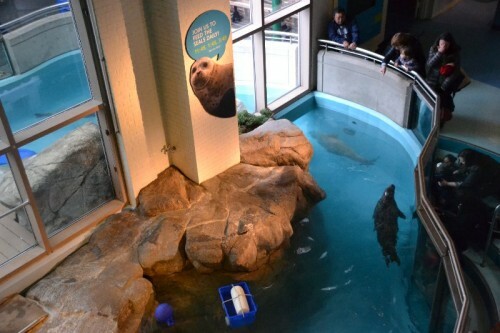 The harbor seals are a favorite exhibit. It’s an indoor/outdoor exhibit. There are daily feedings at 11:45, 1:45, & 3:45. 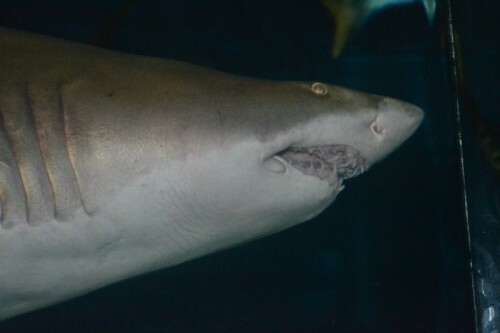 The feedings can be viewed from above or around the tank. 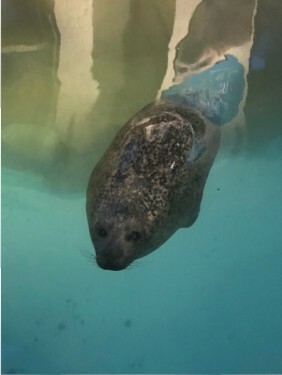 It’s a great time to learn more about the seals and ask some questions. Since this is a popular time to view the sea lions I’d make sure to get there early for a good spot. 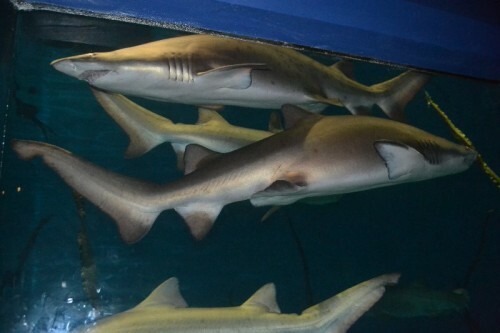 The aquarium features sharks in a 111,000 gallon tank. 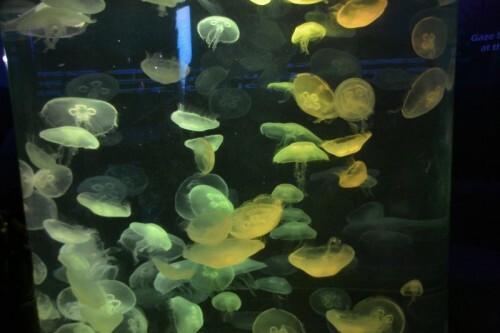 This is a memorable exhibit where you can sit and watch these amazing underwater animals or get up close to the tank. 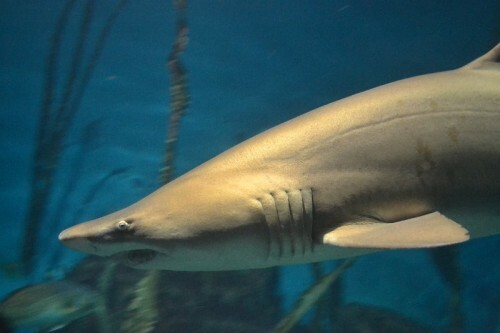 Watch the Aquarium Dive Team on Thursdays, Saturdays, and Sundays at 12:15 and 2:15. Do dragons really exist? 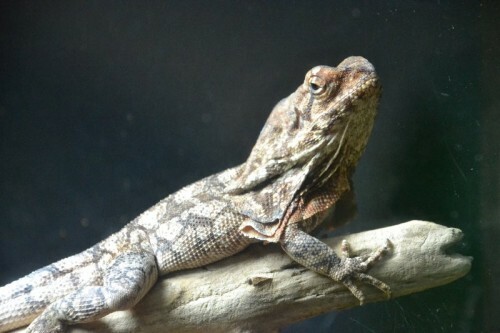 The aquarium has a whole exhibit dedicated to animals who resemble dragons. 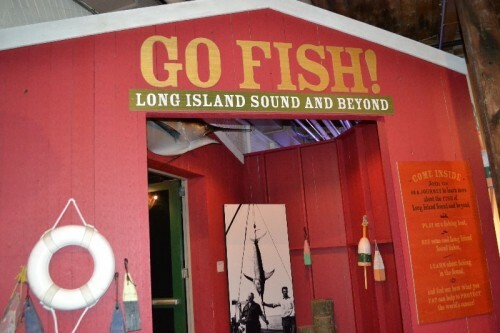 The Go Fish exhibit features fish from Long Island Sound and beyond. 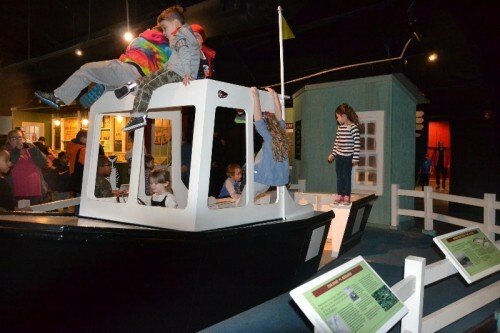 The kids will love climbing aboard a fishing boat and pretending to be fishermen. 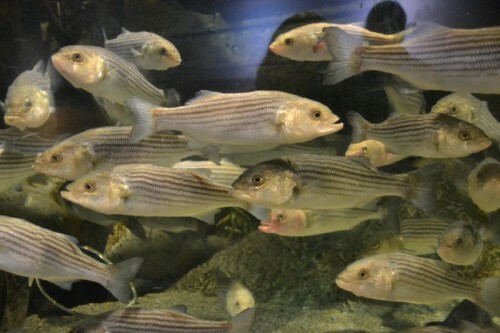 They can get an up close look at more fish in tanks and learn about fishing in the sound. 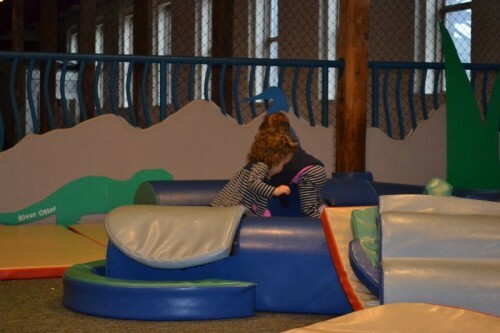 Upstairs is an area dedicated to children 5 years old and under. 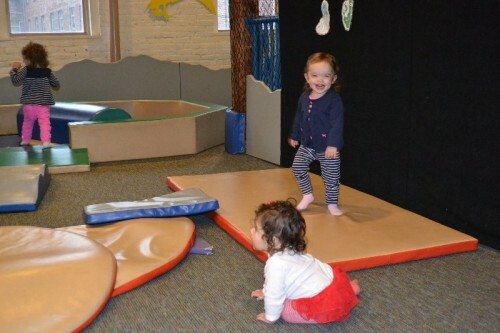 It’s a no shoe zone with lots of soft foam mats for little ones to build, climb and play. 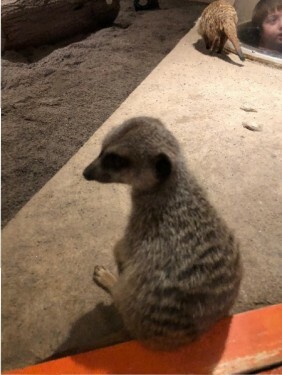 The Meerkat exhibit is my favorite. The cuddly animals seem to be as interested in us as we are with them. They have tree limbs to climb. 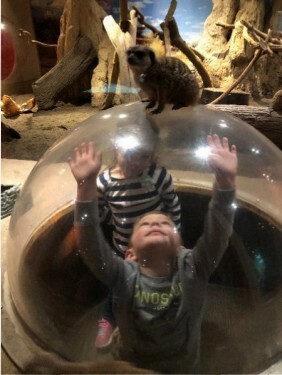 Our kids can even pop up in a bubble into the meerkat enclosure. 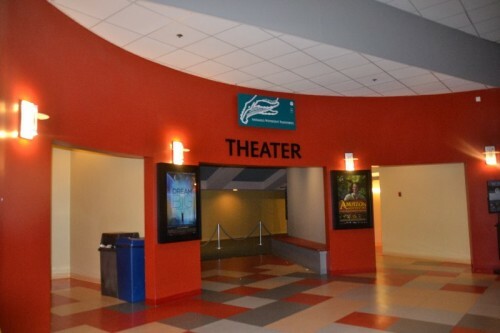 The Maritime Aquarium is home to the first and largest IMAX theater in Connecticut. A movie is included with the price of your admission. The movies rotate in so there is always a selection. You’re able to select the time of your movie when you purchase your admission. We got to the movie about a half hour ahead before the doors opened to ensure that we got a good seat. 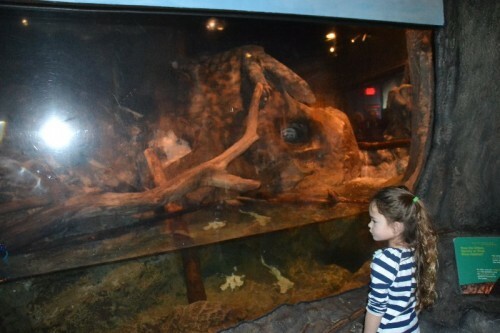 We visited the aquarium on a very busy day but we were still able to see all of the wonderful exhibits offered. 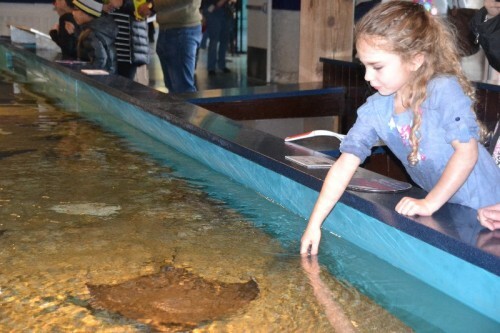 The aquarium can easily be an all-day adventure. I would suggest planning beforehand (chances are you’re already doing that if you’re reading this!) – visit the aquarium website and become familiar with the the special events and times so you don’t miss a thing! Enjoy your visit.